When you think of plumbing problems, your mind probably jumps instantly to a clogged toilet or jammed garbage disposal. 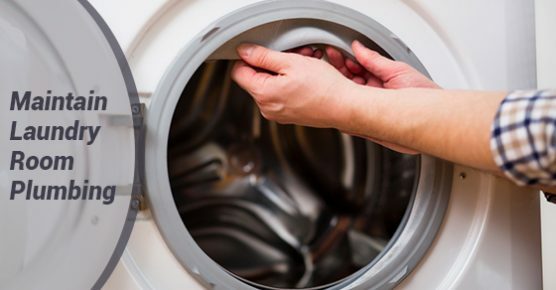 Problems with your washing machine aren’t on the forefront of your mind, largely because they happen rarely enough that you don’t have to worry about them as often as leaky pipes or faucets. In fact, they happen rarely enough that you might not even know when there is a problem, which could lead to a laundry room plumbing crisis. Keep an eye on the washing machine hoses, especially if they’re rubber. Rubber hoses are susceptible to leaks and cracks. If they need to be replaced, consider going with stainless steel hoses instead. Make sure that you have strainers in your drains that will keep hair and debris from clogging the lines. Consider installing a flood alarm in your laundry room to warn you of leaks. Get your washing machine checked out if your laundry stops feeling or smelling as fresh as it used to. You don’t want it to quit halfway through a load of laundry. Like with any machine that runs on electricity, check that the machine is still plugged in, that the breaker hasn’t been switched, and that you have power running to the outlet. Make sure that the water hoses aren’t twisted or kinked. If your clothes just aren’t coming out clean, wash your machine. Washing dirty clothes can make for a dirty machine, which understandably reduces its efficiency. Try washing out the tub with ammonia or detergent, rinse it thoroughly, and then wipe it out with bleach. Finally, run the machine through a complete wash cycle before you put in another load of laundry. Look up DIY troubleshooting online for detailed instructions if you feel comfortable working with electric or plumbing problems that are worse than straightening a hose or slipping a circuit breaker. Otherwise, call your Advanced Plumbing expert to take a look. Not all washing machines are created equal. If you want to conserve water, there are some brands and styles that will be more efficient than others. Front loaders are generally better at conserving water than traditional top-loaders. If you’re in the market for a new machine, do your research first to decide which kind will work best for your needs. No washing machine is invulnerable of course, and all of them will have problems when they get older. But getting a professional opinion on the best machine that fits your budget and desired quality will work in your favour. Avoiding plumbing problems is virtually impossible, but if you’re prepared with the right information, anything is manageable. If you run into plumbing problems in your laundry room, feel free to give us a call at 416-769-8800.